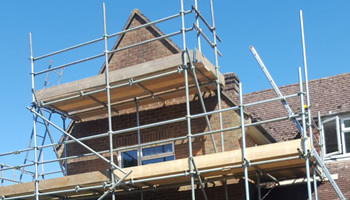 We have been working as scaffolders in Haslemere and the surrounding villages for over 20 years, erecting scaffolding structures and providing no-obligation scaffold quotes to local customers. With over 20 years' of experience, Alan and his team have the knowledge and skills to work on any type of scaffold project. Whether you are a domestic customer looking to paint the outside of your house or make external repairs, or perhaps you are a commercial contractor who is looking for a trusted partner to work with you on large projects, Airo Scaffolding can help. We have a fantastic reputation throughout Surrey, with most of our domestic work coming through word of mouth referrals and our commercial work comes through repeat business from contractors that we have worked with in the past. We are an extremely friendly and professional team so if you have any questions, please get in touch and we will do our best to help. To provide you with an accurate quote, we like to visit the site. Not only does this allow us to make sure we give you an accurate price but it also allows us to talk to you about your project so that we can offer advice which may make your life a little easier. We can arrange a suitable time to erect the scaffolding and once your project is complete, just let us know so that we can come back to dismantle it all for you - again, at a convenient time. You can take a look at our Checkatrade page to see reviews from our previous customers. If you are interested or would like more information about how we can help with your scaffolding project in Haslemere, please give Alan a call on 01798 368080 or you can e-mail us via our contact page.